Soulcalibur IV producer Motohiro Okubo has a busy week ahead. He’s going from the Tokyo Tekken Masters tournament in Japan to Gamescom in Cologne, Germany all within a span of a few days. But this week of intense travel didn’t stop him from spilling some interesting details about the state of Soulcalibur VI. In a somewhat cryptic response to a question about whether or not he would be able to make it to LA for a press event next weekend, Motohiro Okubo might have revealed that Soulcalibur VI has gone gold and is therefore in the final phases before release. While there is no confirmation for this, the timing does make sense with the street release date, just two months away. That’s not to say that development has finished on the game though, what with day one patches all but an accepted norm of the industry. There’s also an upcoming season pass on the books, which will bring four additional characters to the 17 already announced. But that wasn’t all the news from Okubo this weekend. While speaking at the Tokyo Tekken Masters tournament earlier this morning, the producer revealed some details about how the new story mode will play out. Soulcalibur‘s overarching story has always been a convoluted one, what with non-canon endings in each game and a seemingly overall lack of planning. It looks like the team at Project Soul are trying to fix this issue by going back to before the first Soulcalibur and plotting out a new, interweaving story featuring all of the characters. This can be seen in the new timeline below, which can be somewhat understood even without a translation. Although this timeline was briefly seen in the story trailer posted a few months ago, we weren’t allowed to see the full picture at that point. 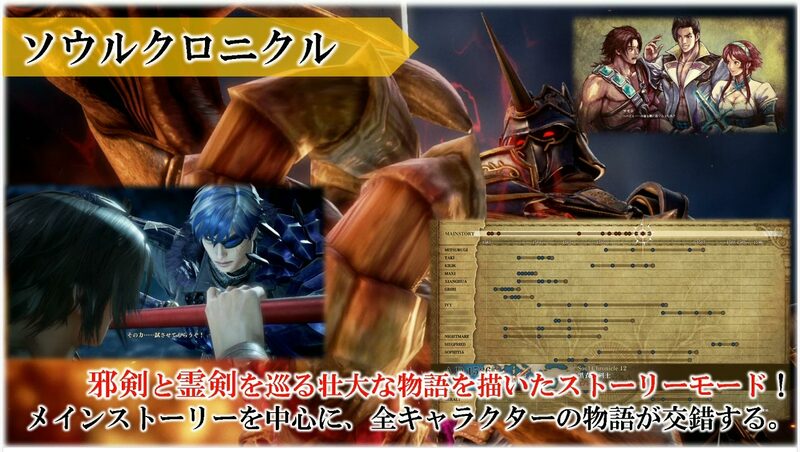 While the timeline shows which characters will possibly interact with each other and where they fall in the main story, it also shows that there are at least five other characters yet to be revealed. Obviously, Namco are keeping those characters close to their chest for future reveals, but if Hilde isn’t one of them, then they screwed up. I’ve got a lot of hope for this game, and frankly after the disaster that was Soulcalibur V and Soulcalibur: Lost Swords the only way this series can go is up. I’ll see you on the stage of history when Soulcalibur VI releases for PlayStation 4, Xbox One, and Steam on October 18.